In the Routledge Handbook of Sport and New Media edited by Andrew C. Billings and Marie Hardin, Walter Gantz and Nicky Lewis address fanship differences between traditional and newer media and explain, “Thanks to advances in technology, lucrative transmission rights contracts and a responsive fan base, sports are available 24/7 throughout the year on an ever-expanding number of platforms. Sports fans can and do follow the action across platforms, their use driven by love of sport rather than loyalty to outlet. (eds Billings & Hardin 2014: 19)” Gantz and Lewis claim that platform use is both complementary and competitive. online and mobile platforms provide fans with sports content when games are not aired (eds Billings & Hardin 2014: 19). outlets like to proclaim they are Number One in any form of usage (eds Billings & Hardin 2014: 20). 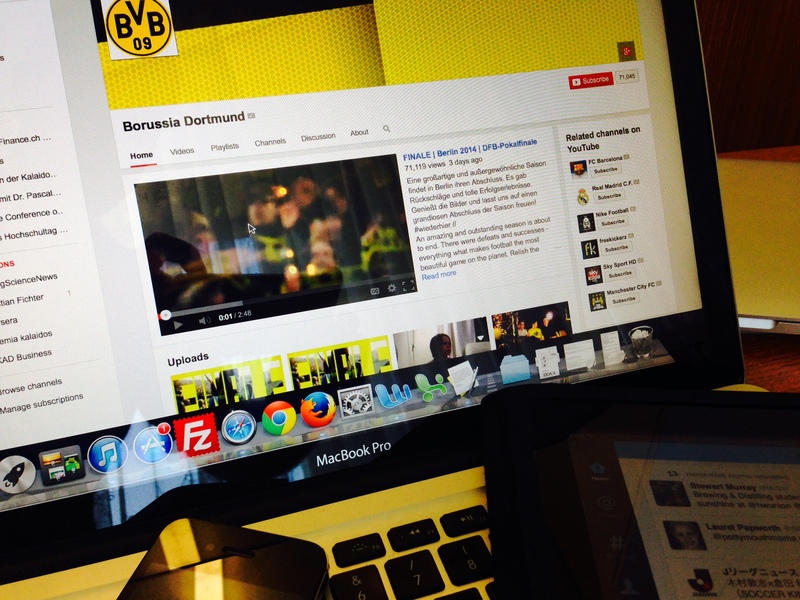 Projecting the statements above about complementary and competitive platform use onto Bundesliga club Borussia Dortmund (BVB), we soon discover that BVB has five major online media outlets: their official website, Facebook, Twitter, Instagram, and YouTube. Let’s take the seven points mentioned by Gantz and Lewis and apply them to BVB’s major online media outlets. Princeton.edu explains that “zero-sum describes a situation in which a participant’s gain or loss is exactly balanced by the losses or gains of the other participant(s). (Princeton.edu 2014)” That is one of the beauties of the internet and social media. In regard to content, there is no limitation of consumption. Football fans can watch a game report on a YouTube channel and read another report of the same game on a blog or online newspaper. Stephen Nuttall, Senior Director Sports at YouTube EMEA, discussed at the Sports Symposium in London on 15 May 2014 that there is no limit to channels on the internet, only a limit to the number of people who have something interesting to say. Mr Nuttall also mentioned that half of the views of the sports content on YouTube come from what happens around the games. For BVB that means that if more content is generated by any club or other producers and published online, the opportunity for brands to be seen, spread and/or experienced around the globe does not decrease. From my own experience, I can state that the more content is published on a social media channel such as a blog or YouTube channel, the higher the possibility of multiple views on that site. ‘Related posts’ sections on blogs or ‘suggested videos’ on YouTube enhance a users experience by giving them tips on what could be of interest to them and drive traffic onto ones site. Hence, increasing consumption of content. BVB, or any football brand for that matter, does not need to be afraid that their content will not be consumed, because their potenital users would consume content from a competitor. Instead, one of the main reasons why users would not consume BVB’s content could be, because it is of inferior relevance or production-quality of that of, say, Kicker, Germany’s leading football magazine. However, I claim that since football brands do not have to compete for their fans’ attention, as correctly underlined at the 2014 Sports Symposium by Charles Allen, Head of Marketing at Arsenal FC, that threshold is relatively high. Fans can forgive inferior quality of a club’s content, because they trust the brand that stands behind the content, namely, the football club. In the case of Borussia Dortmund, it is safe to state that their content is of high quality and relevance. Nevertheless, consumption can also be based on a user’s personal preference. Mitch Joel claims that “rapid and consistent communication through powerful content is the new advertising. (2013: 179)” Because of that, it is essential for any brand to create relevant content and spread across the right channels within the appropriate context. As mentioned above, BVB operates with five major online media outlets: their official website, Facebook, Twitter, Instagram, and YouTube. These five channels have their own characteristics, which we will look into now. The official website. Merriam-webster.com defines the a ‘web site’ as, “a place on the World Wide Web that contains information about a person, organization, etc., and that usually consists of many Web pages joined by hyperlinks. (Merriam-webster.com 2014)” The BVB website can be considered a hub for supporters and stakeholders of the club. The site shares information about the club, players, match-days, shop, the company and its other divisions, and it gives users the opportunity to find the official social media channels with just one click. Twitter. 935,417 people follow Borussia Dortmund on Twitter – number retrieved on 18 May 2014. Newman et al. claim that “Twitter is the largest real-time social platform in the world. … While it’s true that Facebook is the largest social website in the world, it lacks the inherently open, nearly instantaneous nature that Twitter offers to all users. (2013: 54)” Gary Vaynerchuk describes in Jab, Jab, Jab, Right Hook, that ‘a brand’s success on Twitter is rarely predicated on the actual content it produces. Rather, it correlates with how much valuable context you add to the content–your own, and that produced by others. (2013: 84)” It can be observed that BVB tweets out information which is very time-sensitive. For instance, BVB played the DFB Cup final against Bayern Munich on 17 May 2014, and BVB tweeted out all major happenings of the match to keep their followers up to date with the game. Furthermore, BVB made sure that all pre- and post-event action was covered. Always keeping in mind the context of the story that has to be told in that specific situation. Twitter content differs from Facebook and the website content mostly in terms of timeliness. BVB followers on Twitter expect information, pictures or videos right when they happen, not ‘a bit later’. This is due to Twitter’s fast-paced nature, as well as to its mobile-optimized app design. YouTube. By now, it can be considered common knowledge: YouTube is the second-largest search engine on the World Wide Web, just behind Google. The title of Erik Qualman’s 2013 book release ‘What Happens in Vegas Stays on YouTube‘ depicts the power of YouTube very well, which we underline with the following official stats: More than 1 billion unique users visit YouTube each month; 100 hours of video are uploaded to YouTube every minute; and, YouTube reaches more US adults ages 18-34 than any cable network (YouTube.com, Retrieved 18 May 2014). YouTube can be seen as a host for videos that enables brands to embed their videos in their websites or simply share them on Facebook, Twitter or other social networks. Due to the interconnectedness of Google and YouTube – Google owns YouTube – YouTube videos are included in Google searches, which enhance traffic to the video platform. Having produced over 500 videos since 2006, BVB has built a vast pool of content that can drive traffic towards their YouTube channel and eventually onto their official website. BVB publishes videos of different context on YouTube, from press conferences to fun backstage footage or training sequences. The club then decides where to spread the video, depending on the context of the story. Even sitting in front of the TV will involve a mobile device ready for online communication. Sports Symposium tweeted a statement by Charley Classen, General Manager EMEA at ESPN, who commented on the same panel as Mr Nuttall that “Passionate niche followings can now have a chance to follow & watch sports” through new media. (@SportsSymposium 2014) He called it ‘The game around the game’. I completely agree with both Mr Nuttal and Mr Classen and would claim that the use of mobile technology to enhance the football experience does not only complement ‘traditional consumption of the game’, it potentially strengthens the relationship between the user and the football brand–which leads us to the next point. The (arguably) main sports product of a football club – the match – takes place once a week and lasts a little over 90 minutes. The entire experience might last two to three hours with pre- and post-match discussions with other supporters or game watchers. But what about the rest of the week? Brian Solis (2012: 3) claims that “People will always talk about you, so give them something to talk about.” In a similar vein, Henry Jenkins (2006: 3) states in his book ‘Convergence Culture: Where Old and New Media Collide‘ that “In the world of media convergence, every important story gets told, every brand gets sold, and every consumer gets courted across multiple media platforms.” Mr Jenkins coined the term “affective economics”, which according to him, “encourages companies to transform brands into what one industry insider calls “lovemarks” and to blur the line between entertainment content and brand messages. (2006: 20)” In the context of a football brand like Borussia Dortmund, it is essential that followers and fans receive ‘fresh’ content on a regular basis, preferably on a daily, if not hourly basis. Especially, platforms that are easy to navigate and keep oneself up-to-date on, like Twitter and Instagram, need to push out content very often. As just mentioned, preferably hourly. Facebook can be a little slower, and the official website might do with one piece of news per day. The crucial point here is to frequently push out messages on mobile-optimized platforms, which BVB does very thoroughly. Picking up on Mr Jenkins’ point, we can argue that brands gain visibility and stay present by continuously posting relevant content between match-days. And, keeping in mind Mr Vaynerchuk‘s statement that “Breaking out on Twitter isn’t about breaking the news or spreading information–it’s about deejaying it (2013: 85)”, hints brands towards considering and respecting the context and timeliness of their content. In our BVB example, this means, that the club should create a content publishing plan that follows in real-time what happens in the BVB house. An example could be, the official visit of an official of the German Football Association, which gives a good story. Or, following a training session with the team and posting pictures and videos in real-time. An obvious story to share is the press conference before the match as well as other media dates. BVB is a good example to follow. The club keeps their following up-to-date with tweets and different media formats and engages their followers with retweets and @mentions. Tom Fox, Chief Commercial Officer at Arsenal FC, stated at the Sports Symposium in London on 15 May 2014 that it is important to use more social media engagement to pull as many (international) fans towards [a club’s] owned media to bring them closer to the brand. Especially, football brands are predestinated to be “lovemarks” in an “affective economy” given the passion that their fans bear for them. Hence, engagement with the target audience will not have to be forced, but will happen intrinsically resulting in a stronger brand connection. Based on my professional experience, I claim that the higher the frequency of engaging content optimized for mobile consumption is, the stronger the brand bond between a brand and its supporters will be. Benjamin Franklin once said, “Lost time is never found again.” Thinking about informal conversations with friends in our immediate circles, we could argue that people in our modern 21st century society are more prone to spending quality time instead of wasting it on trivial things–even though trivial is subjective. Nonetheless, social media statistics show interesting and very high numbers in regard to social media consumption. According to a Mashable article by Matt Petronzio, the American adult (18+) spent in average 11 hours a day with electronic media in the last quarter of 2013 (Mashable.com 2014). This obviously means that Americans value new media and time spent on it. However, since we are living in a world of abundant content, football brands such as BVB face the threat of time-scarcity in regard to social media consumption of their followers. As mentioned above, 100 hours of video are uploaded to YouTube every minute, which is proof of the vast amount of content just coming from one platform. Consumers do not even face the question, ‘Which platform shall I visit for relevant and high-quality content?’ Often, content simply finds them through Twitter, Facebook and other social-based websites – which leads us to our next point. “Start by understanding that no one cares about them. People care about themselves. Anyone who tweets about a brand or favorites a brand is doing it because it is a symbol of who they are–it is a token, it is a badge. It’s about them, it’s not about the brand. Projecting the above-mentioned statements onto the BVB brand, it can be observed that the underlying principal to win over a consumer’s trust and receive her attention is by connecting on an emotional level; because something moves consumers (Godin), they trust the brand (Hunt), and, because the connection is build upon purpose (Solis). BVB would need to tap into their supporters passion for the game and especially for the club/brand, which moves them to tears of joy – and sometimes sadness. Because BVB as a club provides their fans with genuine experiences in the stadium during matches, as well as between matches, trust has been build. Last but not least, the connection between a fan and BVB is build upon the purpose to create a memorable experience for everyone involved. Social media can create a lot of buzz very fast in regard to new technologies and platforms. In addition, since most of the platforms that stay alive on the World Wide Web stay alive because they serve a specific purpose not covered by another platform, it can be argued that they are Number One in that specific space. For instance, as we discussed above, Twitter and Instagram both are defined by providing their followers with timely content in a specific context. It can be asserted that Twitter allows its users to post text-only messages, wheres an Instagram message has to come with a picture or video. However, it is more important to look at the platforms in terms of a community that consists of two different audiences, which may or may not be overlapping. Which of the two platforms is the actual Number One will be subject to a user’s preference. I do not consider this point to be of high importance in regard to competitive social media consumption, because of the points mentioned in the previous paragraph. It is imperative for football brands to consider which are the essential social media platforms that can drive traffic to the official website and engage supporters to build stronger and sustainable relationships with the brand. As we discussed in this post, there are opportunities for complementary social media consumption, as well as threats for competitive consumption. As a general rule-of-thumb, I assert that, given the nature of social media, complementary consumption outweighs competitive consumption by far. This is a logic continuation of The Long Tail, as proclaimed by Chris Anderson, where “The future of entertainment is in the millions of niche markets at the shallow end of the bitstream. (Wired.com 2004)” With that said, let’s hit BVB’s Twitter and Instagram feeds to see what is happening right now at Westfalenstadion and Hohenbuschei.